Every woman is fond of house stuffs. As the saying somewhat goes like this "a woman is a light of the home", would you believe that? A wife is responsible for beautifying and keeping the house clean and orderly. 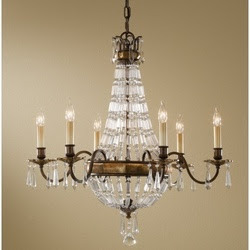 Well, one of a house stuff that woman like me adores in the house is the chandlier. Murray Feiss chandliers are pretty awesome though some are pretty expensive but of course the quality is great. What do you think of the image above, is it cool or what? As for me, it is very nice and it stands out in the crowd of similar style. I don't know but as I saw this one, makes me like to have one. Ahh.. do you like to own like that folks?